TNUSRB Tamil Nadu SI Syllabus, Study Materials, Book List Free Download. The Written Examination for Sub Inspector of Police selection will be of degree standard. The basic knowledge of +2 standard of all the subjects will be the basis and it will go up to degree standard. HISTORY OF INDIA : Dates and events relating from Indus Valley Civilisation to the present day Indian modern administration. GEOGRAPHY : Regions of India, Weather, Monsoon and Climate, Rainfall, Natural Calamaties, Crops, Crops pattern, Indian Towns and Places, Hill Stations, National Parks, Major Ports, Crops and Minerals, Location of Major Industries, Forests and Wildlife, Population distribution in India and other related topics. ECONOMICS AND COMMERCE : Agriculture, Major crops and crop pattern in India, Industrial Development, Major Medium, small scale and cottage industries of Tamil Nadu Village and Rural Development in India. Housing, Drinking water and other development schemes – price policy, Inflation, population and unemployment problems, imports and exports. Industrial development and five year planning. INDIAN POLITY : Indian Constitution, Salient Features, Citizenship, Elections, Parliament and State Legistature, Executive set up of States, Judiciary system, local self Governments, Centre-State Relations, Language Policy, Foreign Policy. CURRENT EVENTS : Latest development in Science and technology, political developments in India, New developments in Trade, Transport and communication, historical events. Fine arts like dance, drama, films, painting, major literary works, Games and Sports, National, International awards, National and International organizations, Abbreviations, who is who, Books and Authors, General Technology, India and its Neighbours, present day India and other related topics. Arts, literature, culture of India and Tamil Nadu. LOGICAL ANALYSIS : To analyse any information logically and to analyse the given information to find out various dimensions of it. NUMERICAL ANALYSIS : Quick response with regard to numerical ability will be tested. COMMUNICATION SKILLS : Effective usage of languages will be tested. INFORMATION HANDLING ABILITY : For any given information, the various aspects of the information, the inferences and connected facts will be tested. POLICE STANDING ORDER (PSO) : The provisions of PSO and its application at various points during the functioning will be tested. POLICE ADMINISTRATION : General rules with regard to the day to day administration of the department will be tested. CrPC., IPC., EVIDENCE ACT : The basic knowledge and day to day usage in the Police Station and in cases which are handled in the Courts. 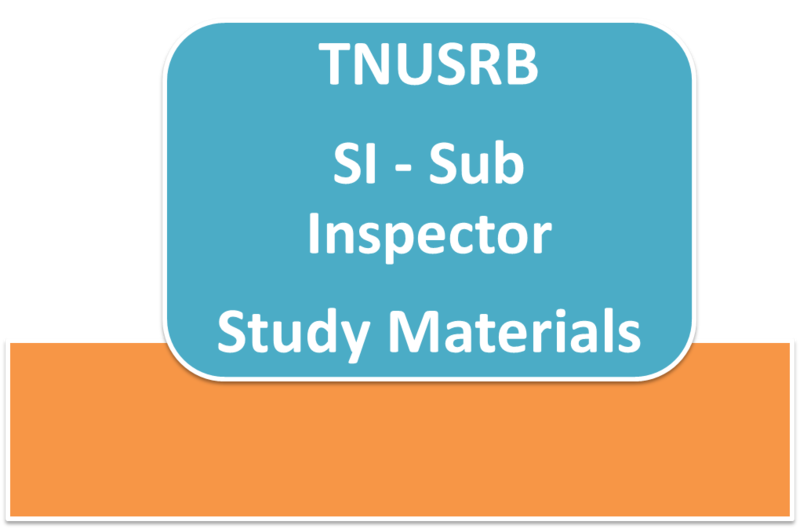 what are the books we can refer for the TNUSRB Tamilnadu SI Exam? I think both the format. Hello sir ,my native pondicherry, I like TN police sub inspector post ,I eligible the exam? ,say yes or not.other state seat allowed? yes or not. please send me the si exam study material. my eye sight is low if i did laser surgery i am i eligible for police? I am from kerala, and may I know that the exam is conducting in English or Tamil?